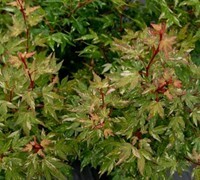 Harbor Belle™ is a true dwarf Nandina, sometimes called "heavenly bamboo" for it's bamboo-like appearance. 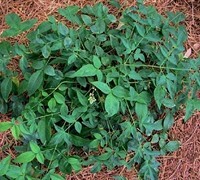 Growing to about 18 inches in height with a spread of up to 3 feet, the base of this clump-forming plant consists of open cane-like branches topped with fine compound leaves that are glossy dark green and leathery. New leaves emerge in shades of pink and develop burnished purple-red and pink hues in winter. In summer, white panicles of small star-shaped flowers appear followed by abundant clusters of round red berries that are maintained through to winter. Exceptionally versatile and easy to grow, this handsome and beautiful evergreen shrub provides a nice soft texture in the landscape and can be used as a specimen in small gardens or in small groups or planted in mass as a groundcover in sunny or shady. 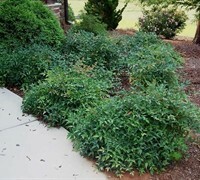 Harbor Belle™ Dwarf Nandina is most useful in small to large groups as a groundcover or patch. When spaced 24 inches apart plants will fill in nicely to form a soft-textured patch in the garden, making them a perfect choice for underplanting small trees such as Dogwoods, Redbuds or upright Japanese Maples or as a large-space groundcover. Harbor Belle™ Dwarf Nandina is easy to grow in sun or shade and well-drained soil. Consistently wet or soggy soil can cause problems with the roots. It is exceptionally low maintenance requiring little if any pruning. Over the years we've seen absolutely no problems with insects or disease.